Coil Heat Exchanger – Anguil Environmental Systems, Inc. The specific form that coil heat exchangers take is the shape of a coil. Wound around an invisible core, the long thin heat exchanging tube is piled on top of itself in a snake-like fashion. Usually metallic material is used to create these coil heat exchangers because it is more conductive than plastics or rubbers. Common metals that serve as heat exchangers include copper, titanium, steel, nickel and aluminum, as well as a variety of other metallic alloys. Besides its conductivity, certain metals are also chosen based on how they may be altered to improve the efficiency of the heating system. For example, titanium may be developed in a corrugated style, a jagged texture that positively affects the heat exchanger system for water and vapor applications. On the other hand, a smooth surface cooper coil would be a better match for oil coolers. Stains and coatings may also be applied to the metallic surface to improve the longevity and efficiency of coil heat exchangers. A common coil design involves one end of the pipe feeding the main body of the coil while the other end goes through the center of the coil heat exchanger when the appropriate coil size has been reached. It then joins the first end of the pipe in connecting to a heat exchanger pump that circulates the heating or cooling substance through the coiled tube. This system is efficient and effective because of the constant circulation within a confined space as well as being a system whose every detail has been planned to improve the heating or cooling process. 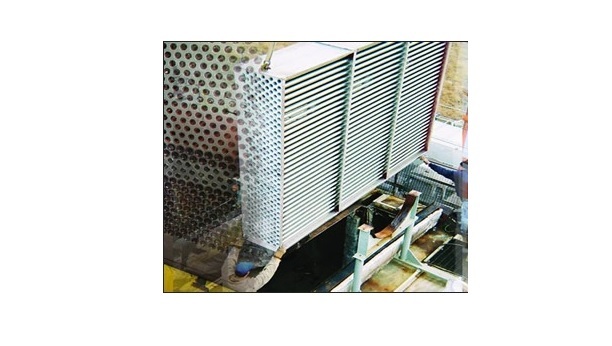 Many industrial, commercial and residential applications depend on heat exchangers to run vital machines and systems. Air conditioning and central heating systems as well as chemical processing, power generation and vehicle operation all require some form of heat exchanger. The coil forms are particularly useful in heat pumps, compressors, oil coolers, sump coolers and any application involving gas or vapor condensation. Coil Heat Exchangers Following the same major principle of the heat exchanger family, coil heat exchangers warm up or cool down liquid, gas or vapor with other liquids, gases or vapors that do not actually come in physical contact with the substance being cooled or warmed. The body or structure of the heat exchanger keeps the two substances from contaminating one another.